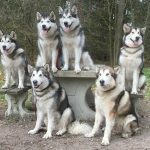 Sled dog breeds are special breeds to say the least, and can easily be identified by a set of physical attributes. 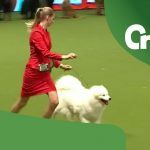 While the representatives of these breeds are gorgeous and quite pleasant to look at, the real challenge is dealing with the mentality of these breeds, and each and every breed manages to throw its own hurdles at the owner. The dog’s back is very muscular and at the same time lean, the upper back is more broad than the lower back, the spine is well protected underneath a thick layer of muscle, and due to the heavy muscle mass, when the dog wags his or her tail, he or she is actually wagging half his or her body. The hind legs, the most powerful part of a sled dog’s arsenal, are relatively thin at the bottom and bulky at the top. They have a lot of power behind them, meaning that their muscles are well developed. The tail, at first sight gives the impression of thickness however that is just the coat. The tail actually has normal dimensions for a medium sized dog, however it is a bit thicker at the base. Before moving on to the mental attributes, you must first understand that these breeds are not exactly your average dog breeds. They were bred for an active and often times demanding lifestyle, and with every generation they have become more and more accustomed to these demands. That being said, these dogs tend to be a bit on the wild side of things, and often times you will find it very hard to control your dog, simply because his or her very nature is being denied by a passive pet lifestyle. These dogs have a fairly developed pack instinct. 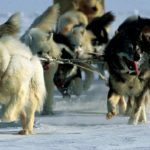 A single dog is more or less unable to pull a sled by himself or herself, therefore they had to get accustomed to working alongside other dogs in order to pull a sled in unison. Average sled packs can get up to 12 dogs, and fighting amongst each other will bring them nowhere. That being said, these dogs can easily work and get along with other dogs, especially from their own breeds. These dogs are very intelligent. Yet another attribute which results from hard work, mainly because pulling a sled is not a mechanical job. 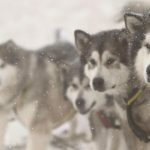 The dogs have to more or less assess a situation, interpret signs, negotiate terrain, and above all else manage themselves and each other as a pack. Another thing to understand here is the fact that these are working dogs, and though ones at that, so they have been bred to understand human commands and even read certain signs that the owner does in order to make things easier. They have a very strong personality. This is more or less to be expected from working dogs that are though by nature. 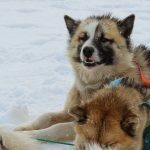 It is widely accepted that pulling a sled over long distances is not without its dangers, and the dogs have to be able to interpret these dangers and respond to the appropriately. Another cause for this toughness is the fact that have to deal with harsh environments, difficult weather conditions and unforgiving circumstances most of the time, so it goes without saying that these dogs come by default with enough willpower to not give up when things get hard. They go stir crazy if they have nothing to do. These are very active breeds, and their entire purpose in life is to burn as much energy as possible. That being said, if they have nothing to do, or simply are not subjected to any physical activity, they will go stir crazy and they will start doing a lot of crazy stuff. They are not dangerous or anything like that, however they tend to be a bit hard to handle while in this state. They are mischievous. The last but by no means the least item on this list, mischievousness is a trait which is native to these dogs. They are supposed to live a very active lifestyle, and as such they can get bored very easily. Combine that with the intelligence that they sport, as well as the strong personality that they come equipped with, and you have yourself a bullying about to happen. Make no mistake about it, they will prank you, they will make fun of you, they will play dumb, they will be stubborn on purpose and they will generally look for ways in which to annoy you for the sake of their amusement. It comes as no surprise to us that these dogs are actually very easy to motivate and train. 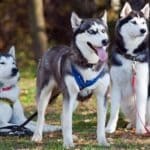 Sled dogs breeds have been designed to work alongside humans, and as such they tend to please when all the conditions are met. Granted, the training for these dogs is different from the training that your average house pet goes through, and it will require you to put a lot more effort into it that you normally would, but the end result is well worth it. 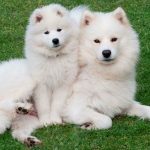 Training start at a young age for these breeds, while they are still puppies, and they have a great learning capacity, allowing them to breeze through the simple standard commands and graduate to harder and more complicated ones fairly easily. One thing to keep in mind is the fact that training is necessary for these breeds because they carry a large risk of aggression. Technically, these breeds are closely related to the dog’s ancestor, the wolf, and without proper training, they be a bit on the aggressive side, not to mention the fact that they tend to get a bit overprotective without the right training. 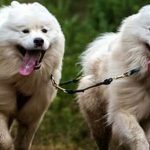 There are a few things to bear in mind when it comes to training these dogs, and one of them is the fact that they are very intelligent. That being said, they can and they will exploit the fact that you are using treats in order to motivate them and reward them when they execute the commands correctly. This might result in our dog only executing the commands if he or she really feels like having that treat, so it is advised to keep the treat usage to a bare minimum, and be quick to switch off of it. Another good tip for training your sled dog is to always tire him or her out before training. Not to the point of exhaustion, but to the point where most of his or her energy has been burned out through exercise, so the dog is not as easily distracted and can concentrate more on the training at hand. There is also the risk of taking it to the extreme, and there are a lot of people out there that have imposed such a strict training routine that they ended up with badly adjusted dogs that behaved more like soldiers than anything else. Discipline is a nice thing for your dog to have, however do make sure you don’t overdo it in order to have a well-balanced and well-adjusted dog. 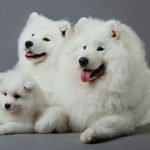 Another thing you have to understand about these particular breeds is the fact that they like to venture off and take risks other dogs would not normally take. They are curious, they are intrigued and they can be easily amused at times, so don’t get too surprised when your dog all of a sudden veers off into the woods or starts doing things that are out of the ordinary. It’s his or her way of exploring the world, and even though it might be dangerous at times, such behavior is to be left unpunished. 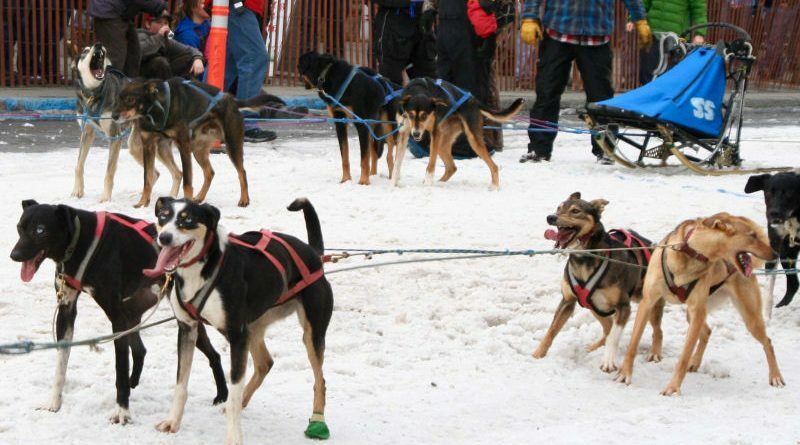 Owning a sled dog breeds is not an easy thing to do. You have to not only take an active interest in the training needed for such a dog, but also account for the little mishaps and problems that can come along the way. There will be a lot of people that downright discourage you from acquiring such a dog, and even though it’s a little harder and a little tougher than an average pet dog, managing an active working breed dog is something that gets easier and easier the more training the dog receives. If you are committed and serious about acquiring such a dog, make sure you have the willpower, the dedication and the overall patience for it, and the end result will be well worth the effort.